If you’ve been diagnosed with adrenal fatigue, you’ll want to make this drink a daily staple. If you are fighting a cold or need a battery recharge - drink the Singing Canary. It builds your immune defenses and detoxes your body. Due to the high vitamin C content it fights cancer and has weight loss benefits to boot! It has been formulated for tired, inflamed bodies; each ingredient was chosen to be a powerful adrenal healer. This beverage has no caffeine, it contains only ingredients that together create a delicious ADRENAL REVIVER! It contains 1 teaspoon of adrenal rebuilding, inflammation-fighting turmeric powder. This is a single serve recipe that makes 1 full quart to be sipped on all day. Recipe can be doubled for a 2-quart sipper! Peel the yellow rind off the lemons using a sharp paring knife, leaving as much of the white pith as possible (bioflavonoids in the pith are a healing component). Slice each lemon into 4 chunks, remove the seeds, and throw the lemon pieces into your blender along with the water. Blend well. Strain the mixture through a fine sieve or nylon mesh bag into a bowl or pitcher. (You can purchase these bags at a paint store inexpensively.) If you are pressed for time, just use the juice of the lemons and don’t worry about the straining. Pour the strained juice into the blender. Add all the other ingredients except the ice cubes, and blend really well. Certain lemons have stronger flavored pith than others. 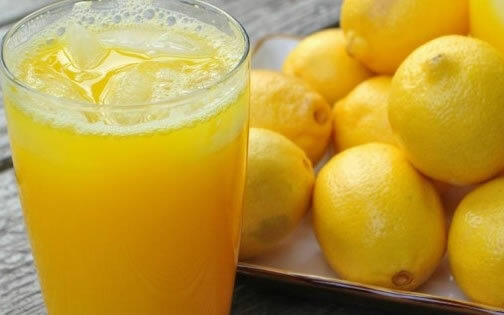 If you find using all the white from your lemon is causing too bitter a taste in your drink, you can use only the juice from your lemons. You’ll be missing out on the bio flavonoids which make the vitamin C more easily absorbed so make sure to use a buffered, vitamin C ascorbic powder that contains bioflavonoids. Note for pregnant women - Turmeric is considered safe during pregnancy when consumed as a food. There is some concern that it may possibly stimulate the uterus to cause contractions when used as a supplement however ginger has similar properties and concerns and it is often suggested by doctor’s to treat morning sickness for pregnant women. It is common for 3 teaspoons of turmeric to be suggested as supplement dosage. We think the 1 teaspoon in the Canary is a safer dose for pregnant women as that is the amount that people in India consume on average through food. But, we are not doctors. Each pregnant mama should consult the advice of her physician. If concerned, pregnant women can always reduce the amount of both Turmeric and Vitamin C to 1/4 dose or not drink the full two quarts per day just to stay on the cautious side. The full dose of vitamin C is not recommended for pregnant women. To read about additional health and weight loss benefits of the Singing Canary, click here!